THIS IS ONE OF THE ENGINEER PHOTOS AND IS PART OF THE SAME COLLECTION THAT INCLUDES THE UPSIDE DOWN LVT(1) WITH THE MEN STANDING ALONG SIDE IT. ONE OF THE SAME MEN CAN BE SEEN AT THE FAR LEFT OF THIS PHOTO - AT THE HORIZON LINE. THE LVT SHOWN IS DEFINITELY AN LVT(2) WITH ITS BOW AT THE LEFT. THE PROFILE OF THE BOW FROM THIS ANGLE SHOULD BE POINTED WITH A SLIGHT SLOPE DOWNWARD. NOTICE HOW THE BOW HAS BEEN DISTORTED AND PUSHED UPWARD. IT SEEMS TO ME THAT THIS IS THE SORT OF DAMAGE THAT A LAND MINE WOULD CAUSE. THIS IS AN ENLARGEMENT OF THE SAME LVT(2) SHOWN IN PHOTO #1. NOTICE HOW THE BOW DAMAGE CAN CLEARLY BE SEEN. NOTE THE BOW PROFILE AND THE ANGLE OF THE MACHINE GUN IN ITS MOUNT. 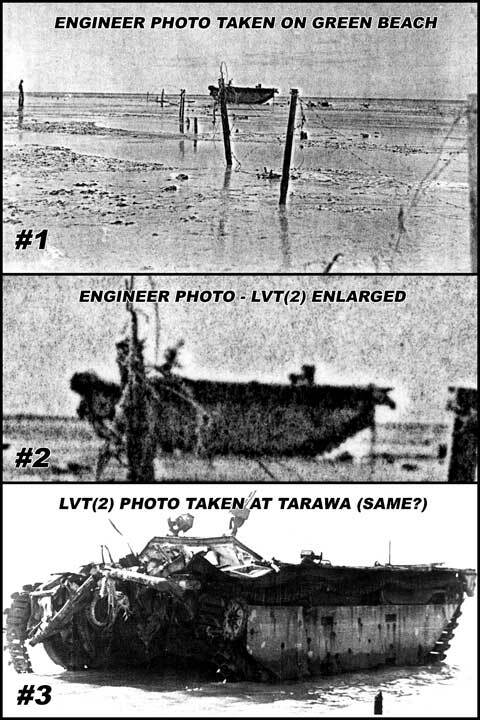 THIS PHOTO WAS REPORTEDLY TAKEN AT TARAWA AND IS SUPPOSED TO BE ON FILE AT THE NATIONAL ARCHIVES. I DO NOT KNOW ITS LOCATION THERE. HOWEVER - IT SEEMS TO BE THE SAME LVT(2) THAT IS DEPICTED IN PHOTOS #1 AND #2 ABOVE. NOTE THE BOW DAMAGE AND THE ANGLE OF THE MACHINE GUN IN ITS MOUNT. THE PHOTO HERE HAS BEEN CROPPED SOMEWHAT, BUT THE ORIGINAL SHOWS IT IN AN OPEN AREA - WITH NOTHING BUT OCEAN BEHIND IT. would expect from a land mine explosion. 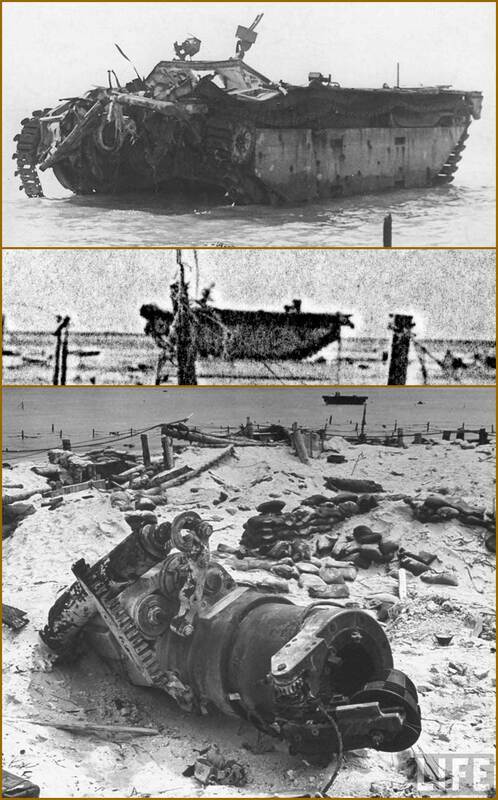 My own belief is that these photos are all of the LVT(2) near the southwest end of Green Beach. 2nd Amtrac Battalion records indicate that only two of their LVTs were destroyed by land mines: one an LVT(1) and one an LVT(2). UPDATE: I have recently discovered a LIFE magazine photo which shows this same LVT-2 wreckage in the upper-right background. This photo is of the lower 8-inch gun, that was blown from its mount at the southwest corner of Betio Island, and definately shows the same LVT-2.